I shared this flirty little dress on my instagram a few weeks ago. Totally loving the eyelet detail and the tie-waist, plus the v-neck elongates your neckline, which is just another look I love. Basically, I would design this dress exactly this way, and I love everything about it! And, as icing on the cake, it's SO affordable! It's currently only $27, and there are lots of coupon codes for Shein right now, especially if you buy a certain amount. Basically, I'm saying hurry and go but a bunch of new Spring and Summer things, guys! hahaha But, if you shop at Shein, don't forget to use my "Secrets of Buying Well at Shein" guide! I love to buy from Shein, but I always qualify that statement with these tips! I've recently become obsessed with everything "eyelet" this Spring! I always love and appreciate eyelet fabric, but the obsession has been real the past few weeks! I've only wanted to shop for all things eyelet, and that's saying a lot for this self-proclaimed lace-lover! I even recently got a hat with an eyelet ribbon trim (I'll share that soon on the blog! Love the look I created with it!) I just feel like, along with being sophisticated and girly, which I love, it's also just so cool and fresh. Eyelet + Ruffles is a major winning combination, in my book. 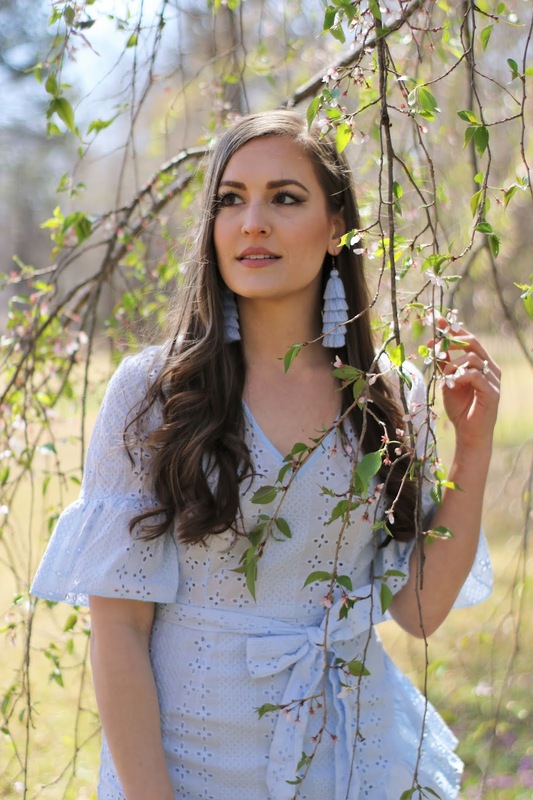 I hope you love the eyelet pieces I've shared, and feel inspired and excited for dressing for Spring! Have a lovely Thursday and a wonderful weekend! Thanks for reading! I'm surprised with that dress from Shein!! Looks so cute and the baby blue is baeutiful!! I was pleasantly surprised! Thank you, Marisa! Have a great Friday! You are such a vision of loveliness in this dress, Jessica. Awww, that's so kind of you! Thank you, Jodie! omg that blue dress is stunning! Thanks, Jadie! I love it so much! Hope you're having a nice evening! Loving the monochromatic look. That dress is so beautiful. Thank you, Sophie! I'm seriously obsessed with this affordable little dress - a new fav for sure! Hope you have a nice Friday and a great weekend! Isn't it fun? Thank you, Carolyna! I hope you enjoy your Friday! Thanks so much, Regine! Have a lovely Friday and weekend! This style is so pretty. Loving the light blue dress, it is perfect for spring. I totally agree! Thank you so much, Dessy! Thanks so much, lovely! I hope you have a terrific weekend! This color looks so great on you. I loved the bag. This is such a cute spring dress! You always pick the best outfits. Jessica, I totally love your fashion sense! So feminine, delicate and sophisticated at the same time. This dress looks amazing on you! The dress is super cute! I need something like this in my life! It's lovely! And I love that you made it a monochrome look. It looks so elegant. I love the whole color tone of your look! Beautiful! You always wear the cutest dresses! 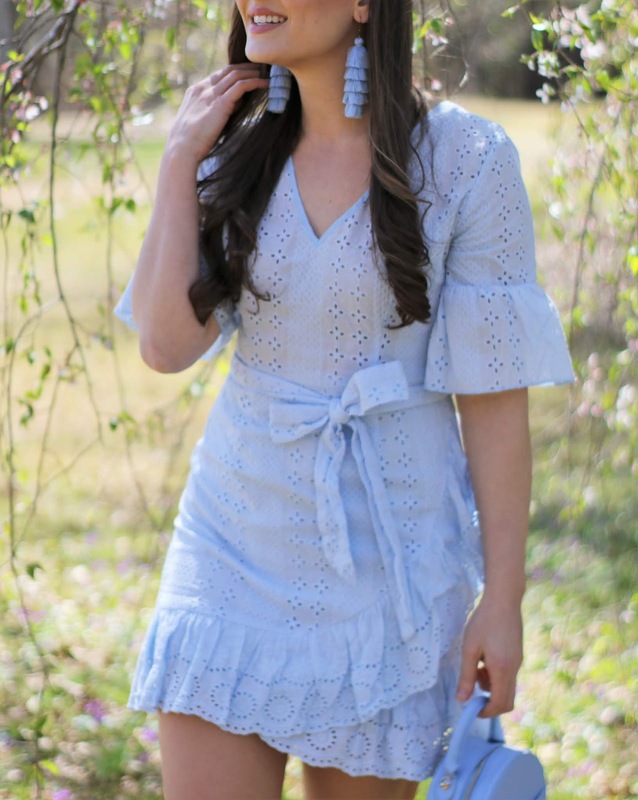 I love the light blue shade of this dress and you can't go wrong with eyelet for spring!